Get the Latest Market Updates and learn why Silver is better than Gold. Silver is a popular precious metal to invest in. While used in a variety of applications for thousands of years, today’s uses are in jewelry, ornaments, kitchen utensils, currency coins, electrical conductors and electronics, etc. In the state of Utah, it can even be used as legal tender, just the same as if you were using cash to make your purchases. Why Should You Invest in Silver? Perhaps the most common answer to that is that it helps diversify an investment portfolio that consists of regular stocks and bonds. The value of silver bullion is not as high as the other popular investment metal: gold. However, it adds diversity and relative security to an investment portfolio when it is taken into consideration that it is not driven by fluctuations in the traditional stock market. Its independent valuation means that even if one type of investment in your portfolio doesn’t do well, the entire value of the portfolio doesn’t diminish and your money is still kept safe. The demand for silver is constantly growing, making an investment in silver relatively stable. Minute amounts of silver are used in everyday household and electronic products and demand for it is constantly increasing. Thus the relative availability is greater than that of gold, making it subject to larger fluctuations. Its high market liquidity is also an advantage when looking to sell, as there will always be interest from potential buyers. Current trends over the past twenty years have showed a steady increase in the value of silver. 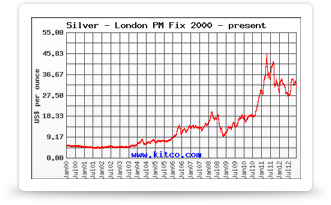 At its most recent valuation in 2012, the yearly cumulative average price of silver was $31.15 USD per troy ounce (the unit used to measure silver and gold). A great type of silver bullion to invest in is one that is easily sold when you want to capitalize on high silver market values. Silver bullion is used as a popular option for investment in silver. Types of silver bullion are traditionally divided into bars and coins. These can be bought from a variety of dealers. Online retailers and local shops are just a few options. Regardless of the option you choose, you should be wary of who you’re buying from and try to make sure they are a reputable silver bullion dealer. If the shop is convenient and located near you, it may be better to do business with a local dealer and you can build rapport and get great deals on any future silver bullion you’d like to buy. They can also guide you on silver bullion coins that have performed well in the past and perhaps even give you advice on lesser known coins that may turn you a good profit.